← Cocktail Jelly Beans, thank you, I’ll have another! 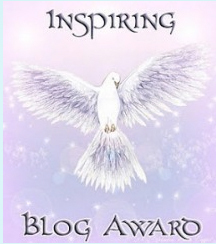 So happy to be nominated for the Inspiring Blog Award. A BIG thank you to “the rays of sunshine” for the nomination. (The logo looks as if it should be church related, and maybe in the beginning it was.) The font is too wizardly for me, but still, it’s an honor to be nominated. 1. I have a list a mile long of crafts, and baking projects. It’s my bucket list. 2. I don’t like Ketchup. 3. Yellow is my favorite color. 7. I am lucky to have such an awesome family! I enjoy them for their humor and food posts: most of them are food related (surprise). Drop in and read those inspiring blogs. Posted in awards and tagged awards. Bookmark the permalink.